Join the Mommy Poppins gang as we host a very special event with Manhattan by Sail. Climb aboard Manhattan by Sail's beautiful Clipper City Tall Ship as we sail in New York Harbor for an exciting pirate themed sail where kids will learn nautical skills (Pirates are sailors, too!) like knot tying, hoisting the sails and other nautical know-how. 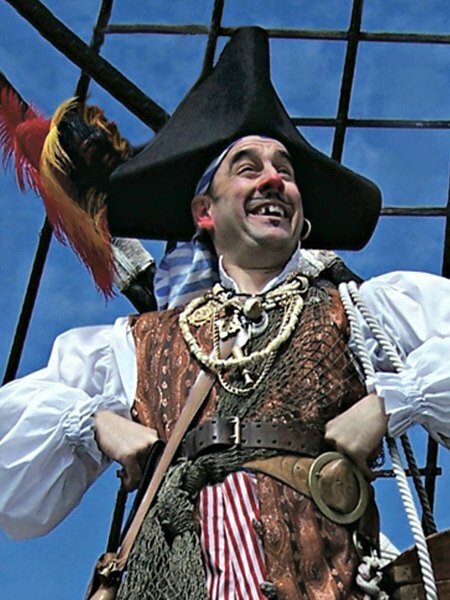 The hysterical Dave Engel will perform his version of Pirate School! that will have kids in stitches. Plus face painters, cool custom temporary tattoos from My Tattoo Rings, an activity booklet from PBS Kids Club THIRTEEN and goody bags. There will be two sails 10am and one at noon. This event is part of a series of Family Harbor Sails with Mommy Poppins and Manhattan by Sail. See the full schedule here. Manhattan By Sail offers unique harbor cruises on historic sailboats. The Clipper City is the largest ship in the fleet: an 158-foot-long replica of the lumber-hauling schooners that made New York Harbor the center of global commerce, with mast and rigging reaching up 120 feet from the deck. Sailing on a tall ship like the Clipper City is a rare opportunity that few people get to experience. The Clipper City sails daily from Pier 17 at the South Street Seaport and offers breathtaking views of the Brooklyn Bridge, the Statue of Liberty and the Manhattan skyline. Pirate School! is a madcap, swashbuckling, interactive one-man family show, created by veteran physical comedian David Engel, has been captivating NYC kids for over 20 years with his bumbling pirate professor Billy Bones who teaches youngsters how to be good pirates with a curriculum that includes how to stand, talk, sing and laugh like Buccaneers. Please note there is limited stroller parking at the dock. Please try to leave your stroller home. In the event of rain you can reschedule for another Mommy Poppins Sail (see the schedule here) or another sail of your choosing by Manhattan By Sail. Our last sail sold out in just a few days so we recommend purchasing tickets early.